Disclaimer: I've not watched enough of this Rugby World Cup to actually make serious calls, but I thought I would just do this for kicks. South Africa v Wales - South Africa, by virtue of injuries to Wales. A convincing but not a thrashing victory. Say, 18-12. New Zealand v France - New Zealand. The upset of 2007 was the upset of 2007. Different circumstances. Say 20-8. Ireland v Argentina - Ireland, despite their injuries, to break their duck of never making it past the quarter-finals. Just. Say 9-8. Too close to call. I admit that I am just taking a random guess here. Australia v Scotland - Australia. Contrary to what many might think, perhaps a scrappy victory by the Wallabies. Say 20-15. 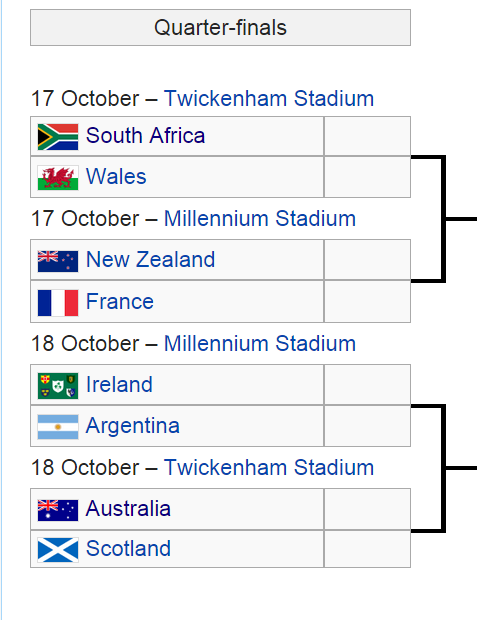 In an ideal world though - or if I called the shots - I would have France play Wales and Australia play Argentina in the Semi-Finals. I do not know which upset I want more. I like the South African team (they are probably my second favourite team), but I would be quite happy if Wales won for some strange reason. But it would be fantastic to see the All Blacks lose again to (vive la) France.. Many are putting their money on an-all Southern Hemisphere Semi-Finals, which looks very possible according to the bookmakers. Not that I am a betting person.